I've always liked this building and how it looks. The redness of the stone has always stood out as it obviously cannot be the natural color. But the blocks above the windows, look at the texture. It appears to have been chipped and carved, which it may have been, I don't know. Each block above the window looks different from the next. Assuming that's the 1889 Germania Bank Building (now St. Paul Bldg., sw corner of 5th & Wabasha), the Ramsey County Historical Society's recently published Rocky Roots, Geology and Stone Construction in Downtown St. Paul, 2nd Edition indicates that it's Jacobsville sandstone from the U.P. 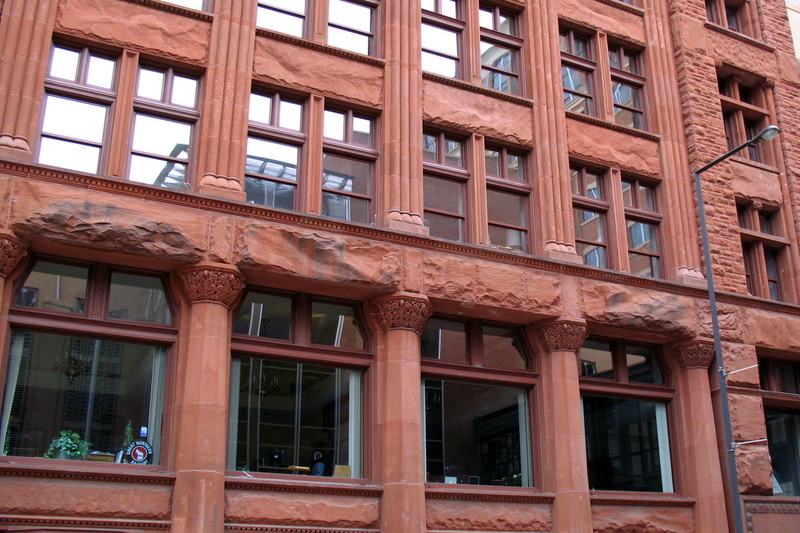 The uniformly red variant is cleverly called redstone and is also used in the Endicott Bldg. (which wraps around the original Pioneer Press Bldg. with entries on Robert and 4th). yes, that's the natural color. there was a building in duluth made of the same stuff, called the Redstone Apartments. No kidding....that is the actual color of the stone. I'm very surprised. Then also the headers above the windows must be hand carved because each is unique. Thanks for the info and I'll have to get some more photos of this building.